Fall has fallen, the leaves have turned, and the mercury has finally dropped below 80 degrees! Wonderful time of year. The big deal this week is, of course, the WABA Cider Ride on Saturday. As of our publication deadline, registration was still open and the weatherperson was forecasting no rain and a high of ~62F, which is, uh, perfect. Other good ways to enjoy the fall colors this weekend are the Bike Rack’s once-a-month Urban Wilderness Ride on Saturday, or BicycleSPACE’s Hills of Rock Creek Park ride on Sunday. Note also that it’s the first weekend of the month, so both the Hills of Rock Creek Park and the Hills of Anacostia rides cater to beginners. Good time to get out there and give them a shot if you’re new! Finally, there is NO Proteus ride on Saturday, on account of the WABA thing. One unusual bit of news is that DC has been picked as a test market for a new cycling app called LaneSpotter. Described as “Waze for cyclists,” LaneSpotter aims to help find good routes by offering maps of bike lanes and trails and by crowd-sourcing tips on the best routes through city streets. Now, I do not have an iPhone, so I can’t tell if it’s good or bad, but what would be cool is if you would download the app, use it a couple of times, and then take this quick survey to let me know how it went. I’m curious if it even has enough data yet to be useful. DO NOT miss this wonderful recollection by Peter Flax on the cross-country bike ride he took with a friend half a lifetime ago. Seriously, make some time. Four Mile Run trail renovations have been done for awhile, and WashCycle has a nice little series of photos documenting the upgrades. I enjoyed this short documentary on Gearin’ Up Bikes. Check their site for classes, open shop nights, and volunteer opportunities. The protected bike lanes at The Wharf are FINALLY painted and ready for two-wheeled traffic. 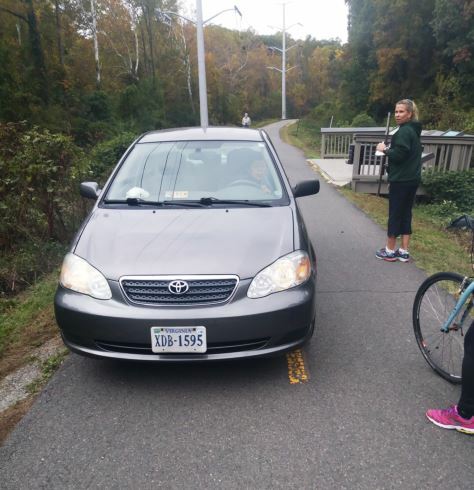 Here’s the tale of a lady who got lost and drove her car onto the W&OD trail. Hmmmmmmmm. OK, onward to the list! If you like this newsletter, feel free to forward it along to friends and tell them to sign up or follow on Twitter. Stay safe, ride fast, ride on. This is the Washington Area Bicycle Association’s signature fall ride, and as of our publication deadline, registration was still open. Three routes available (52 miles, 30 miles, and 10 miles) through some lovely countryside, with a pit stop at Proteus Bikes and, yes, cider! See the registration page for more details. Led once a month by the Bike Rack, departing from their Brookland shop. This 17-mile ride explores some of DC’s extensive wooded landscape, including the National Arboretum, Kingman Island, and the Anacostia Riverwalk Trail. Includes a stop for snacks at Eastern Market! Led by Proteus Bicycles from their shop in College Park. Easy-going, about 12 miles, mostly trails. Heading to Vigilante Coffee in Hyattsville. Bring a lock and some folding money! Follow the shop on Facebook for more details/updates. WABA community ride. Meet at the Virginia Square Metro station for an easy 5-mile roll to the first ever Valley Fest in Shirlington. See some trails, learn some routes! More details and registration here. Gather at the African American Civil War Museum (11th and U) for this weekly 10-mile social roll through DC. “Ride bikes with good people and good things happen. You can ride with us.” For updates, join the Facebook group here. WABA community ride to explore new bike infrastructure in DC. ~6 miles of poking around! More details and registration here. Ride hosted by City Bikes. Meet at the Adams Morgan shop for ~35 miles of RESPECTABLE hills through leafy Rock Creek Park. Bring your climbing legs. Roll-out is at 7pm sharp. Hosted by BicycleSPACE. Meet at the downtown shop. A fun, brisk 20-25 miles of some good climbs and nice views up through Anacostia. This is the first one of the month, so it’s geared toward beginners. Great time to give it a shot if you’ve never done it before! For a little more perspective, you can also check out our Ride Review on the Hills of Anacostia ride. Hosted by BicycleSPACE. Meet at the Adams Morgan shop. Fun, social ride of 20-25 miles through beautiful Rock Creek Park. Enjoy the fall colors and the park’s many roads that are closed to car traffic on the weekends. This is the first ride of the month, so it’s a beginners ride. Perfect time to check it out if you’ve never done one of these rides before. Bikenetic’s weekly hills ride. Meets at the shop in Falls Church. Can be somewhat brutal. Route changes every week, so check the shop’s Facebook page for announcements and details. Bikenetic’s regular Tuesday night mountain bike ride. Very weather-dependent, so often announced the day-of. Check the shop’s Facebook page for updates. It’s the first Thursday of the month, so Phoenix Bicycles is hosting open shop night. Bring your bike problem and use their fully equipped shop to find a solution. Details and contact information here. For the tri-curious. Meet at District Hardware and Bikes (the new location at The Wharf) for a Hains Point workout session with a USA Triathlon-certified coach. More details and registration here. 11/15: All the Cycle Ladies November workshop at Phoenix Bicycles. This month: bike fitting! Registration is free, but required. 11/18: The annual charity Cranksgiving ride! Hop on your bike, ride around the city, collect food for Miriam’s Kitchen!